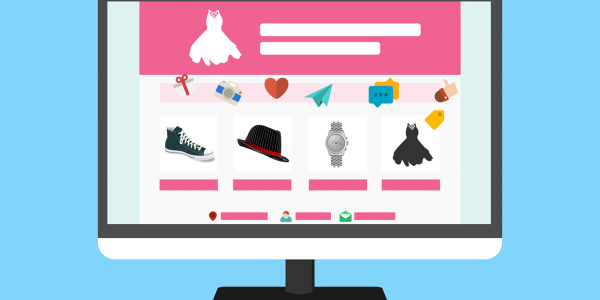 Have you tried online shopping while in the Philippines? Online shopping is very common in the United States with nearly 70% of Americans shop online regularly. A study conducted by Visa showed that 9 out of 10 Filipino consumers are shopping online at least once a month. This seems very high but this study included online banking (bills payment), movie and airline ticket purchases. With the increase of Filipino online shoppers, consumer product retailers are providing online shopping channels locally in the Philippines. 1. Shop only on known and reputable sites. a. Lazada.com.ph – the Philippines’ number 1 online shop. Since Amazon is not yet available locally, this is the Amazon equivalent in the Philippines. View deals of the day for limited time discounts! b. Zalora.com.ph – the Philippines’ leading online fashion store. Get 15% discount by using this voucher. c. Amazon.com – the largest Internet-based retailer in the world. Try Amazon Prime 30-Day Free Trial . d. Online shops from known local Philippine retailers such as Bench. 2. Beware of fake online shops. Make sure to check the spelling of the website address as there are known website addresses that try to be close to the addresses of known sites to try to get your personal information. Some would redirect you to a different website. Check for signs that a website is legitimate and determine if you are shopping on a fake website. 3.Verify compliance for secure payments. Make sure that the payment page of the online site uses secure sockets layer (SSL) encryption. You can verify this by checking the website URL. SSL sites use https:// in the beginning of the website address and typically include a lock icon. Below is an example on the checkout page of Lazada. Online shops verified by PCI DSS (Payment Card Industry Data Security Standard) provides consumers with more confidence in using our credit cards for payment. When you see the security seals such as below, there is an additional comfort in knowing that your data will be secure. When completing payment transactions, provide details only on the required fields. Don’t fill out the optional fields anymore. The lesser information you provide, the lesser personal data can be put at risk. Credit card is the standard payment option for online shopping. When using credit cards for your online shopping transactions, you need to understand the difference between Billing Address and Shipping Address. The billing address should be the same billing address of your credit card in the Philippines. Shipping address can be a different address that does not need to be in the Philippines. As an example, in Amazon.com, I use my Philippine VISA credit card for payments and have the items shipped to a US address. If you do not have a credit card, below are some of the options you can explore. If you are a Globe Telecom subscriber, you can take advantage of GCash. With GCash, you can apply for a GCash American Express Virtual Pay. GCash AMEX virtual pay is a prepaid virtual card linked to your GCash mobile wallet. The advantage of using this is it has a US billing address. I’ve used GCash for retailers that do not allow non-US based credit cards such as Apple Store US. Consider getting a prepaid credit card or some call it a secured credit card if you do not like using credit cards. Online shopping can mean temptation to overspend and accumulate consumer debt. To avoid overspending, a prepaid credit card is a good option. You can only spend the amount you deposit or load to your prepaid credit card. UnionBank offers the EON Visa Debit Card and BPI provides different prepaid credit card options. Recognising that a lot of Filipinos are not yet comfortable shopping online and providing credit card information for local online retailers, both Lazada.com.ph and Zalora.com.ph are offering cash on delivery options. Local online shops such as Lazada and Zalora include free shipping options that can take from 3 days to 2 weeks depending on where the item is coming from. The beauty of online shopping is it allows you to shop from anywhere globally so why limit yourself from the local online shops? There are some products that are not available locally either from physical stores or local online shops. Online shopping provides limitless shopping options from global stores. Shopping from international sites such as Amazon.com has never been easier today. Although the shipping fees will not be comparable to what Lazada or Zalora can offer, you no longer need to break the bank so you can ship your items to the Philippines. The following services provide a US address where you can ship your online purchases. These will then be delivered to your chosen address in the Philippines. ShippingCart is also known as LBC shipping cart. It is an affiliate of LBC which is a widely known courier company in the Philippines. When you sign up to ShippingCart, it will provide you with a US address where you can ship your items and LBC will deliver these items to your doorstep. They do consolidation of items before shipping to the Philippines to save on cost. You can ship items to their US address and they will store these items for free within a 30 day window. Once you are ready to ship, they will consolidate these items and ship. There have been issues with their service in the past few months but will update this post if we see an improvement on their service. My Shopping Box (MSB) provides a similar service with ShippingCart. It has tie-ups with BDO and GCash AMEX Virtual pay to try to make your experience better. 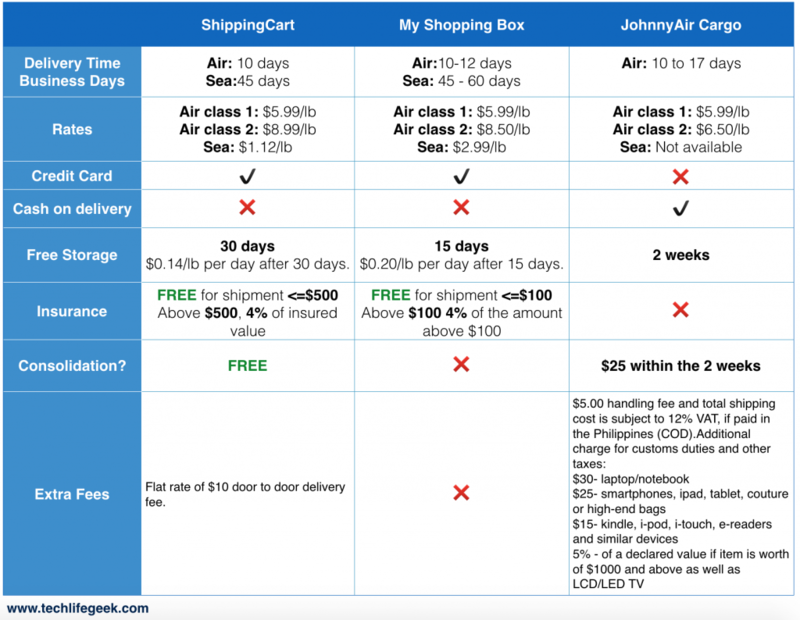 Johnny Air Cargo or JAC also provides US addresses where you can ship your items. Unlike ShippingCart and My Shopping BOX, JAC does not provide you with a unique personal identifier on the US address. You will have to manually send an email to their email address with the shipment information. Also, JAC will not deliver to your doorstep, you will have to choose a JAC pick-up location nearest you. But it does provide a cash on delivery option unlike ShippingCart or My Shopping Box. They also consolidate for a fee of $25 and they can store items in their US location for free for 2 weeks. Compare the options below and choose your preferred service. Similar to ShippingCart and My Shopping Box. You can consolidate items with pobox.ph similar to ShippingCart. What makes USADIRECTPHL unique is it allows you to shop online without a credit card. They can do your shopping for you and have your items delivered to your doorstep or available for Pickup at their Metro Manila office. Do you have any experience in shopping online while in the Philippines? Post your comments below for additional tips and information on how to do online shopping from the Philippines. Go to Amazon.com now and do your shopping! Use the search box below to start window shopping now.